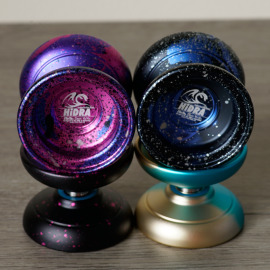 Made in conjunction with Ze’ev Yehuda, the HiDRA was created to be the ultimate ste-up model for players advancing into full metal yo-yos. "At iYoYo, we believe the YoYo community has far more talent than just creating awesome tricks. Ze'ev Yehuda, US student and yoyo player, has one of these talents. He has literally created dozens of cool looking CAD yo-yo designs in his spare time. When we discovered one in particular, we knew we had to get it produced. We got in touch with Ze'ev to see if he wants to see his vision become a product. We prototyped it, tweaked it and we are blown away by how well it plays. Think of a relaxing, solid and stable throw for everyday. We can't wait to see the tricks the community is going to throw with it!